Great article. It's nice to hear someone challenging the “powers that be”. I didn't follow Iceni domestically too much, but I would say that taking two squads to Tour shows that they realise the importance of pitch time for player development. As for shortening lines in a major final, you have to remember the motivations of each team member might be different. Let's divide the team into three groups: “been there, done that” players who have several European titles under their shirt and quite frankly would be happy to give up their own pitch time for the good of the squad; “happy to be there” players who are playing at their first ever big tournament and would love to just get a single point in the final; and the “up and coming” players who have spent a few seasons at the club, are recognised as strong players but have not yet achieve superstar status. I think for the third group, winning is far, far more important than development. They've put the effort into to develop (in their minds at least), and now they want medals. Don't forget that some people are attracted to the likes of Iceni purely so they can get their hands on bling, and if the club fails to deliver then they risk losing some great players. Personally, I have long believed that it is worth losing a game in the early part of the season in order to give much needed experience to a younger player. Blood them early and build them up. The first time I played offence for GB was when we were 11-4 down in a Worlds semi final, which, in hindsight, was a terrible idea. By intentionally benching your stars in some of those Tour games (where you could win 15-3, but instead use the bottom of your roster and win 15-10), everyone is getting experience of performing *when it counts*. 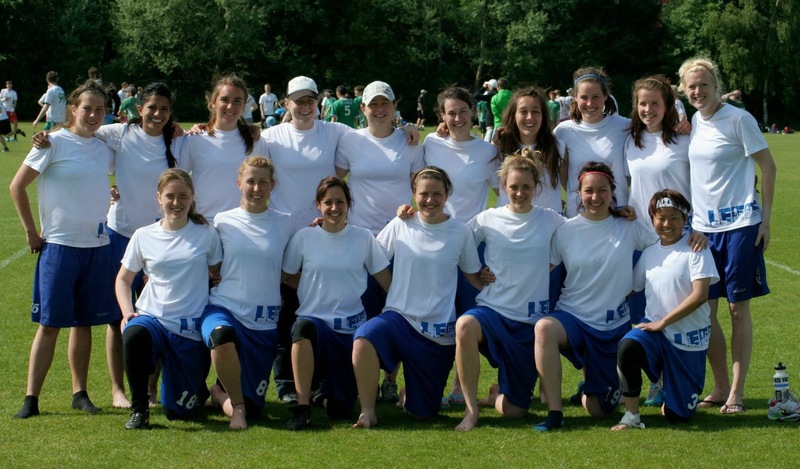 As for whether London can sustain two strong women's teams, I would say that right now there are not enough players of sufficient quality to have two elite level teams, but that without two equally strong teams, UK womens ultimate may become stagnant compared to the rest of Europe. It may require some short term pain in order to get the long term gain. It is also worth noting just how quickly the womens game has progressed in the UK, and with some strong leaders and good coaching, I could easily envision another club usurping the title. Thanks Eddie! It's a really good question. To add another perspective, we're happy to share how Nice Bristols have approached this. We try not to focus on the choice between development and winning. Development has always been high on our agenda and we believe it's integral to our success. For us, winning comes from improving how we play, both individually and as a team. Winning is the bonus, and we've been fortunate to have more and more of these bonuses over the past few seasons. When we were faced with a number of players retiring (aka having babies) a few seasons ago, we had to recruit. You could say these were “development seasons”. We strengthened our links to uni teams, held open training and now regularly get good numbers to training. We didn't hold trials and only selected our 2 teams once we got close to Tour. Our 1st team has had a consistent core, but we've consciously rotated in new players to gain experience. Some of these players are now part of our core, and we've got more coming through. We've also capitalised on connections between some of our newer players, for example the U23's. At tournaments, regardless of the game we don't call lines beyond ensuring we have enough handlers and cutters. If you're on the team, we trust you to do your best for the team. We also agree that pitch time is fundamental to players improving, especially when it comes to 'big games'. Consequently, you're more likely to be thrown on the pitch than off. Giving this opportunity to players has been integral to our improvement. Our squad has strengthened, the experienced players have been kept on their toes and the whole level has gone up. Would we win more if we didn't do this? Maybe in the short term but definitely not in the long term and, either way, we would rather every player shares the glory. With Worlds this year we've offered places to anyone who played on the 1st's last year and helped us to qualify. The result is we only have a few places to fill. We want wins but we still know this will depend on every player improving so, as with previous seasons, we won’t be shortening our lines. For us a shortened line just means every player being under 5ft 4 (and yes, we can pretty much field 7 in that category).